Monday February 10th 1879 It looked a little like rain this morning but when it cleared up at ten oclock Father went after Aunty Smith & Holmes. I got the ironing done by eleven. Rob & Hatt took a ride to the west farm in the afternoon and he took the Auntys home in the evening. I cut and sewed a ball of carpet rags in the afternoon and knit all the evening. 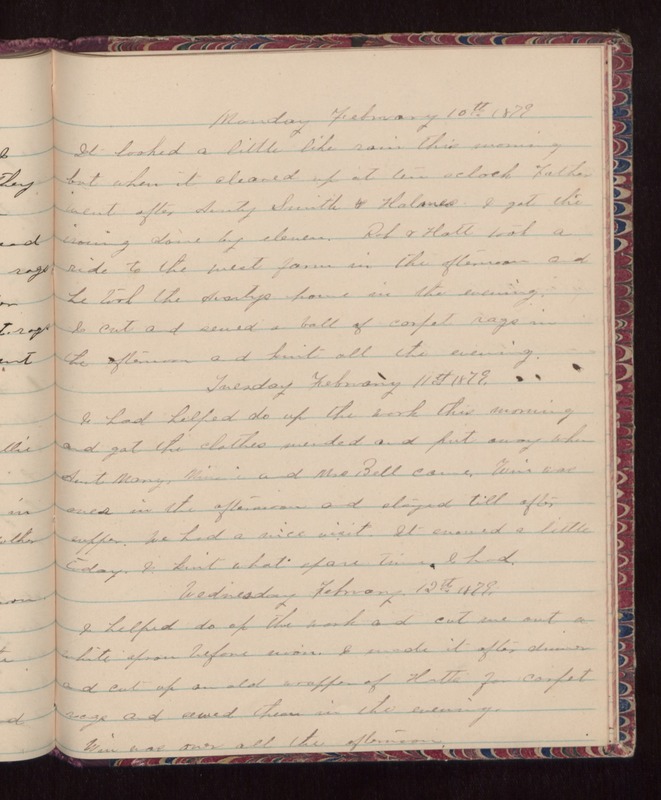 Tuesday February 11th 1879 I had helped do up the work in the morning and got the clothes mended and put away when Aunt Mary, Winnie and Mrs Bell came. Win was over in the afternoon and stayed till after supper. We had a nice visit. It snowed a little today. I knit what spare time I had. Wednesday February 12th 1879. I helped do up the work and cut me out a white apron before noon. I made it after dinner and cut up an old wrapper of Hatts for carpet rags and sewed them in the evening. Win was over all the afternoon.